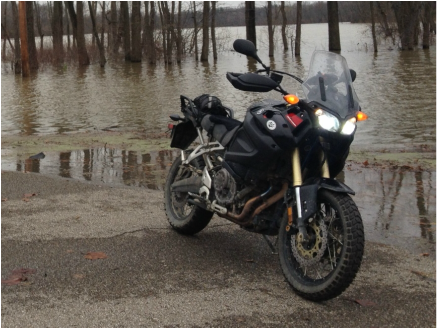 I bought my Super Tenere in March of 2012 from Iron Pony Powersports here in Columbus in a sort of panicked, last minute decision. That’s not to say I hadn’t been thinking about it for some time and knew it was the right thing to do, but, one week prior to departure for a big spring ride, I changed the oil in my Ulysses and found large metal shrapnel. That spurred the ‘it’s time’ initiative. I arranged for the Ulysses to go back to the shop for more warranty work (this story in the Ulysses section), and picked up my new Super Tenere. It had 1 mile showing on the odometer when I arrived; that’s about as new as you’ll ever find. 1 week later, I left for my big trip (the Southern Ride) with over 800 miles on the thing already. About a week after that I arrived home, with over 4000 miles on the new bike. The mileage continued to add up, because this bike was just a joy to ride… anywhere… anytime. It was big, comfortable, fast, and fun. Once rolling, all feeling of its hefty weight were gone, and it was as light on its feet feeling as anything else I’ve ridden. From the factory, it should have come with heated grips and electronic cruise control, but other than those relatively minor additions, it was setup quite well. 2 mode (plus off) of traction control, that worked fantastic; Mode 1 kept everything under control, Mode 2 let things get very interesting (sideways) without it going pear shaped (I’d call this hero mode, because you could slide through every corner like you know what you're doing), and Off was helpful when in very slippery situations when tire spin was required (loose up hills, or low speed slick mud). 2 (plus an unofficial) modes of engine power; Touring dulled things down a bit, while Sport picked it up, an unofficial Super-Sport mode is accessible by using a jumper wire in the clutch switch. I liked this idea at first, but in practice, it’s less useful. Fuel mileage is entirely dependent upon how much you twist the throttle, so with that in mind, I’m not sure the advantage of Touring mode (I would understand if fuel mileage went up). Mine lived in Sport mode for the first half of its life, and Super-Sport mode for the second. The brakes were simply excellent. The front brake lever gave linked brakes, while the back brake lever separated the system (handy for off-roading). The ABS worked in all conditions; wet or dry pavement, and (and this is important) off road! Yes! Gone were the days of shutting off ABS when off road, this system worked! I got in the habbit of only using my front brake lever (because they were linked), and giving as much brake as I wanted (including 100% somewhat frequently), because I knew it was going to work exactly as I wanted, at all times. The suspension worked as well cruising alone on an afternoon ride, as it did with the girlfriend and both our luggage on the back. It just simply worked. Maintenance was light. For my riding, I was changing the oil and filter every 5000 miles, and the final drive fluid every other oil change. It never lost any oil between changes, and it never came out looking bad (black). With my first (break-in) fluid change, I did pull the final drive off and lube all the splines and drive shaft, this wasn’t required, but tends to be a good idea. I was going to do this again at the (roughly) 30,000 mile mark when I did the big (valve check) service. The only other parts I changed were rear brake pads at 12k miles, and the air filter at 15k miles. The factory tires lasted 10,500 miles before I swapped them for Heidenau K60 Scouts. I was pleased with the treadwear and pavement manners of the factory tires, but they were not nearly adequate for off-pavement riding. The Heidenaus worked much better off pavement, and lasted a bit longer (close to 12,000 miles on the rear, about double that for the front), but they did sacrifice some on pavement manners. In the dry, the traction was still acceptable, but they weren’t as confidence inspiring. On wet pavement, especially once they were worn past half way, traction was lacking; I could spin up the back tire going 70mph down the interstate, if I cracked the throttle. I put around 24,000 miles on this bike the first year I owned it. That’s a personal record by far and away. The bike could handle anything I threw at it, from commuting to work to over 800 mile days on the interstate. Off-road it did better than any bike its size should; I took it places that it shouldn’t have been, and it generally handled them with ease. It was truly shocking how well it did off road. Like with the Ulysses, I saw this as my forever bike. I planned to put 100k miles on it in short order, and I was looking forward to it. Like with the Ulysses, its life came to an abrupt and much too early end. Details of the crash can be found in my Spring 2013 Ride (and Crash) Report. For a couple reasons, I did not replace it with another Tenere (despite my overall love for the bike). On occasion I still regret that decision, but the vast majority of the time I am still very please with my choice. I ended up buying a used 2008 KTM 990 Adventure after the Tenere was totaled out; it allowed me to use strictly my insurance money, without adding any savings or financing, and, the KTM is a more extreme bike; it allows for harder riding both on pavement and off. See my Adventure Bike Comparison page for more details relating this bike to my Ulysses and Adventure. A bike of this caliber (price/purpose) should have come with heated grips from the factory... That's one of my (minor) complaints... But with that said, it's easily solved under $100. I've used several types of heated grips in the past, and opted to try the Hot Grips brand this time. This model (Ergo 2) is a very hard rubber that lasts a long time, and is oversize (thickness) for added comfort and insulation for the heating element. I was not pleased with my ordering experience, but it's done now, and they work. With projector lenses and a mechanical high beam cutoff, this bike was basically made for HID headlight bulbs. The factory setup was adequate (2 H7 55 watt halogen bulbs), but once you throw HID's in, it become extraordinary. 55 watt HID's tend to put out nearly double the light from their Halogen counterparts, but the mechanical cutoff means in low beam, I'm not blinding oncoming traffic like you would think ~6000 lumens would. I've had good luck with DDM Tuning for my HID's, and would recommend them. The only long-lasting do-everything tire; it's like it was made for this bike. Much more aggressive for off-pavement riding, while not sacrificing too much in the way of on-road handling. Tread wear is excellent; most report around 12,000 miles for a rear, and double that for the front. Some have reported much more than that, although I have discovered the joys of spinning up the back tire and will must likely eat through it quicker. Wet pavement grip isn't great, but it is adequate. Vibrations are noticeable at some speeds (4 mph and 25 mph), but again, not bad. I prefer to buy from Ride On ADV; good guy, good pricing. Next round I may go with a TKC-80 front tire with this rear. The combination will mean the front and rear tires wear out about the same time (as opposed to 2 rears for every 1 front), but I'll get better traction. So I splurged on this. I didn't want to and I didn't like it, but it needed to be done. There are several less expensive options for skid plates, but they all have faults. Most notably, they bolt to the engine; if you hit hard, chances are good you will rip a hole in the engine despite having bought and installed protective bits. The other problem, this bike is so capable and confidence inspiring, I take it places a bike of it's size never should be; I beat the crap out of it. With all that in mind, I bought the most heavy duty protection parts available; straight out of the 'beat the crap out of your adventure bike' capitol of the world, South Africa. I already had panniers from my Ulysses made by Muffin Top Industries (Happy Trails Knock-Offs), so I just needed to decide on which racks to get for the Tenere. Several companies (Givi, Happy Trails, etc) make racks, but I opted for the SW Motech Quick Lock racks. They come predrilled, so no mounting pucks are requred, simply drill the panniers to line up with the rack holes, and bolt them on. The racks themselves are quick release, with just a few quarter turn fasteners, giving a much cleaner look when the bags are off.